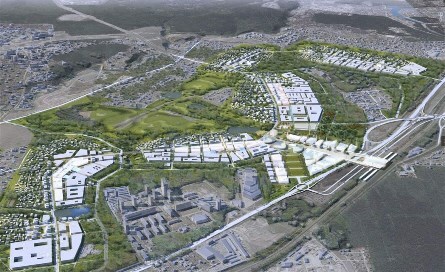 Skolkovo Innovation Center (2010-2020) is a planned city for 20,000 residents to be built just outside of Moscow, Russia. The venture commenced in 2010 as a state-led project and a brainchild of Russia’s then president, Dmitry Medvedev. Russia had recognized the need to modernize its economy by reducing its dependence on oil and gas and by leveraging its human capital towards a more sustainable, knowledge-and-innovation based economy, where industry and academia would work in consort. Skolkovo Innovation Center is expected to contribute to this necessary shift by helping Russia forge a thriving Small-and-Medium-Enterprise and startup culture, focused on science and technology development in five clusters: IT, biomedical, energy-efficiency, space and nuclear technology. The city’s planning principles revolve around the idea of sustainability: Skolkovo will be a city with minimal or zero emissions of environmentally harmful substances, where recourses are managed prudently (buildings will use about 30% less electricity, heat and water than average Russian ones), all waste is recycled, at least 50% of the energy comes from renewable recourses and the transport system prioritizes walking and cycling, with the use of vehicles with internal combustion engines entirely prohibited. The plan is made up of four mixed-use areas, a central zone and a landscaping zone, incorporating the design principles of new urbanism and low-rise, compact development. The new, mixed-use city has been repeatedly dubbed as the ‘Russian Silicon Valley’. Construction is only at its beginning. Adadurov, A. Perspectives of the Infrastructure Development of the Skolkovo Innovation Center. Available here. Butcher, M. 2013. Russia Hopes The Skolkovo Tech City Will Produce Its Great Leap Forward. Available here. Trelewicz, J. Q. 2012. An Analysis of Technology Entrepreneurship in the Modern Russian Economy exploring SEZ, Technoparks, and the Skolkovo Program. IEEE International Technology Management Conference, June 25-27, 2012. Dallas, TX USA. Available here.